Now consider a paradox. With today’s triggering of a no-confidence vote in the prime minister, Britain has descended into maximum “Game of Thrones” chaos. Yet the odds of a stabilizing outcome have brightened. Of course, all statements about British politics should be assumed to include the word “probably” at least twice. But a fair guess would be that the odds of a delay or a revote on Brexit stand at around 60 percent. The odds of some sort of compromise stand at 30 percent. The odds of crashing out are down around 10 percent. Consider the three possible outcomes to today’s vote. If the prime minister fails to secure the backing of a majority of Conservative parliamentarians, she will have to resign. A determined pro-Brexit figure would likely replace her. But selecting a new leader would probably take four weeks or more, leaving no time to renegotiate the Brexit deal before the scheduled departure on March 29. Therefore, the new prime minister could be expected to exercise Britain’s right to freeze the Brexit process. This would arguably put Britain in a healthier position than it has been since the 2016 referendum. A true-believing Brexiter would be in charge and would have to take responsibility for whatever deal he or she negotiated. There would be no more blaming the limitations of the deal on May, who suffered from a lack of credibility among the Brexiting faithful because she herself had been a Remainer. When the Brexiter prime minister got to grips with the negotiation, he or she would discover that May’s deal is hard to improve. But at that point the hard-liners in the party would have to reluctantly own the outcome. What does this mean for our probability estimates? Let’s say the odds of May losing the confidence vote tonight are 30 percent. Of that, 20 percentage points would put Britain on a path to a May-style compromise, but one negotiated by a Brexiter. Because the hard-liners could scarcely denounce a deal that their own faction had produced, just 10 percentage points put Britain on a path to a crash-out. The second possible outcome in Wednesday’s vote is that May wins by a convincing margin. This seems unlikely: Let’s give it 20 percent. If it happened, May would take it as a mandate to try again to get her compromise deal through Parliament. The core of this deal is a surrender of economic sovereignty to Brussels in return for control over immigration, stability in Ireland, free-trade in merchandise goods and an end to budgetary transfers to Europe. 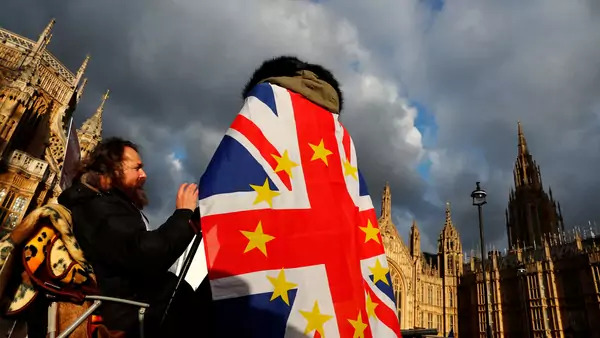 The surrender of sovereignty is severe, and deeply unpopular — Britain could not negotiate its own trade deals, and would have to abide indefinitely by European regulations that it had no part in shaping. So, of the 20 percent probability of a clear May win, only half — say, 10 percentage points — leads to a compromise Brexit, bringing the cumulative probability of this option to 30 percent. If May won the no confidence vote comfortably but still failed to get her compromise through, what would happen? May would not want Britain to crash out, and neither does the majority in Parliament. So the alternative to getting her deal through would be to consider other deals. But there aren’t any compelling ones. Some Conservatives have floated “Norway for Now,” meaning that Britain would leave the E.U. but remain in the Single Market, at least temporarily. But that would involve accepting free movement of people from the EU into Britain and contributing to the budget, yet still not having a say in the Brussels regulations that Britain would live under. Other Conservatives back the “Canada option.” But a free-trade deal like the one between the E.U. and Canada would not avoid a destabilizing border in Ireland, and therefore would not be acceptable to the Europeans. In short, if May wins the no-confidence vote by a comfortable margin, and if she nonetheless fails to get her compromise through, Brexit will probably be postponed or put to a new vote. Britain might exercise its right to freeze the exit process and then never return to the negotiating table. Or it could freeze and hold a new referendum. The third possibility is that May wins today’s vote, but only by a narrow margin. This seems quite likely: Let’s give it 50 percent. This outcome would deprive May of any hope that she had the political strength to get her compromise deal through Parliament. This would force a consideration of the alternatives laid out in option two: Norway, Canada, and so on. The outcome would be the same: Either an indefinite postponement or a referendum. So all 50 percentage points in option three flow into the postpone or revote bucket, bringing the cumulative total to 60 percent. Of course, this is just a collection of guesses, but they may be the least bad ones available. They suggest that Britain’s parliamentary chaos comes with a silver lining for the nation.